for almost 200 years, the camera has led humans the world over. This world is today scarred by climate change, migration and economic inequality. Despite the fact that these crises are most evident on the earth's southern hemisphere, we are at least as captivated here in the north. People move, conditions change and the landscape accordingly. There we have the starting point of ”Encounters”: the Nordic countries in the world and the world in the Nordic countries. the Exhibition at the Hasselblad center collects five nordic photographers. All deal with the global world through the camera. In ”I called out for the mountains, In the heard them drumming” has Miia Autio portrayed the rwandan refugees in the neighbouring african states where they now live. The landscape behind the portraits are hidden by white rectangles so that they become as uprooted visually, that of the forced migration. Is the man a white sheet, or is the environment there? In the Autios portrait appears both as pieces in a larger puzzle. the Puzzle, the exhibition will continue through, but unfortunately, this is the respective artist's projects separately. If they had instead been mixed, I believe that a clearer, global dialogue should have been established. Now I experience the exhibition as rigid, piecemeal, even if the individual works will remain strong in the respective part of the gallery space. Nanna Debois Buhl, for example, joined to the base by the photographic technique. On lakansstora photosensitive fabrics, she has placed the industrial residues from the ongoing transformation of downtown Bucharest. The cotton has been stained purple by the light of the sun, while the objects from the former communist era in the country, leaving the white pattern on the fabric. The batik. Peculiar, for Johannes Samuelsson's work is how he regular throws an socialrealistiskt light of the near on the surreal conditions that people are sometimes subjected to. 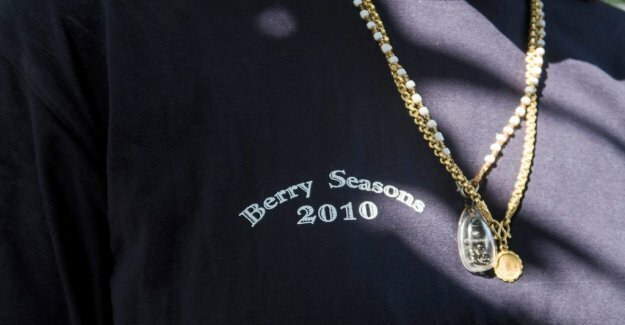 From having followed the hot dogger Helmer Holm in Umeå cool urban transformation the past few years, He now struck up with the incoming of berry pickers in northern sweden. With close-ups of hands and tools in the work or rest, it appears the same timeless rootlessness as in the Autios portraits. Here, however, it is not migration, but an increasingly competitive, global labour market that is behind. waiting for Sandra Mujingas video installation ”Catching up”, where the three persons in soft clothes and poses recurrent stroking and caressing each other lovingly. As the digital movie is broken down into pixels and then re-provided to a consistent picture, repeated words of encouragement for increased self-esteem as Mujinga have found on the internet. If other works in the exhibition deals with the structural problems in today's society, reminds Mujinga about how even feelings nowadays is the subject of a global market – and how they can possibly be won again. To counteract the life and work continued fragmentation is required a collective, conscious presence beyond the yoga class or chat. ”Encounters” is a first step in the right direction.